Lucy from Sydney Vintage Bikes sent us these lovely shots from Sydney of her niece at Mona Vale Beach. Lucy sells cool, restored vintage bicycles on Australian eBay. She's previously sent us some cool Cycle Chic Down Under shots. Thanks to Buvös for sending in this classic "waiting for the drawbridge" pose from Utrecht. Brendan in San Francisco sent this photo in, with this text: "After weeks of temperatures in the 40's (Fahrenheit) we finally got a few days of sun and temperatures in the mid 60's! Here's a picture of my girlfriend enjoying her new (old) bike on Golden Gate Park's JFK Drive, which is closed to auto traffic on Sundays." Thanks, Brendan! 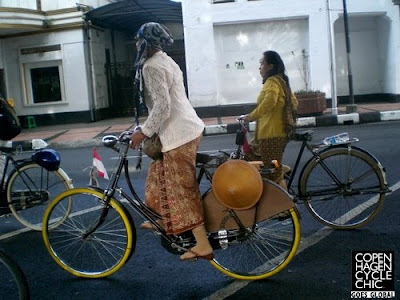 And thanks to Gustar for this spot of Indonesian Cycle Chic. Beautiful outfit, beautiful bike. The photo was taken by Ben from Mahanagari. Lavinka sent this photo in from Poland. Wonderful stuff. Brian in New York spotted these shots on the always cool Refinery29 in a piece about Hot Wheels. The pair of photos above are from Teen Vogue. These two shots are from an issue of Amelia's Magazine, photographed by the brilliant photographer Gemma Booth. 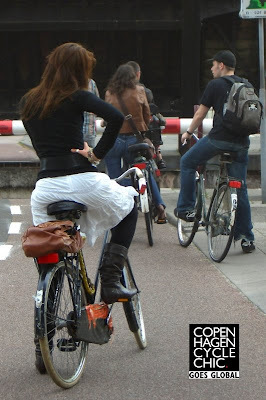 Cycle Chic rolls on across the planet. they're all so cool. 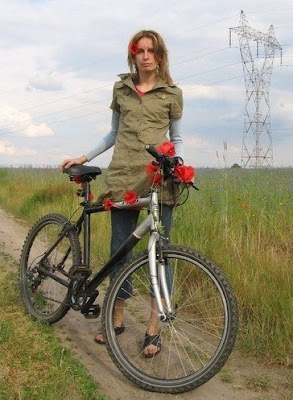 i like the Poland pic showing that you can be chic on a mountain bike. 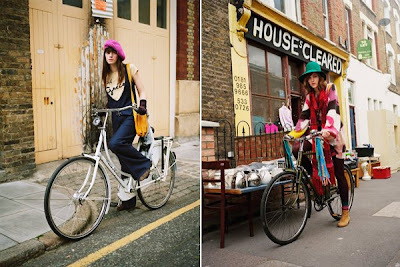 i'm not so excited about the last two shots from Amelia's magazine... the photography is nice, but it's not real copenhagenized cychelchicness, just fashion shots with bikes because fixies are hotter accessories than handbags this season. "not real" says i.
wow, what a cool blog! I should make more pictures of stylish people riding their bike! I wish I could look this good on my bike! I'll get there eventually. San Francisco photo is a bit boring, not so chic.. sorry.